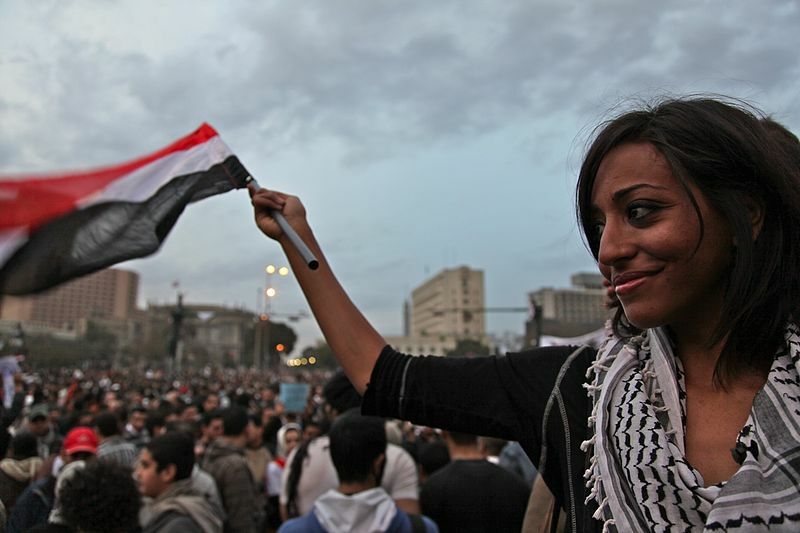 This in-depth profile looks at key participants in the 2011 Egyptian uprisings as well as the first post-Mubarak presidential election candidates. In addition, you will find a few contemporaneous articles that demonstrate the impassioned atmosphere at that time. If you think yourself a man, come with me on 25 January. Whoever says women shouldn’t go to protests because they will get beaten, let him have some honor and manhood and come with me on 25 January. Whoever says it is not worth it because there will only be a handful of people, I want to tell him, You are the reason behind this, and you are a traitor, just like the president or any security cop who beats us in the streets. Later in 2011, Asmaa Mahfouz was arrested for slandering the Egyptian Military rulers. She was referred to a military court, prompting activists, such as potential presidential candidate, Mohamed Elbaradei, to protest her being charged in a military court. Eventually the Supreme Council of Armed Forces renounced the charges and Asmaa was released. Born in 1985, Mikael Nabil is a 26 year old Coptic Christian political activist and blogger. In April 2009 he founded the No to Compulsory Military Service Movement. He demanded to be exempted from military service. Instead, he got arrested on November 12, 2010, but was released two days later and was finally exempted from service. Nabil also participated actively in the Egyptian Revolution, highlighting the fact that Egypt had been ruled by the military for six decades. He posted a video blog titled, “The Army and the People Were Never One Hand” on his website, maikelnabil.com, which ultimately led to his arrest on charges of “insulting the military”. He was sentenced to two years in prison and during this period Nabil maintained a hunger strike that began in August 2011. Demonstrations took place protesting Nabil’s imprisonment on December 29th, 2011 in Tahrir Square. He was eventually pardoned by the military council January 23, 2012. Nabil’s pardon follows months of campaigning by No Military Trials, an activist group that has mobilized many Egyptians against army rule. Essentially, Nabil sparked one of the largest demonstrations against military rule. 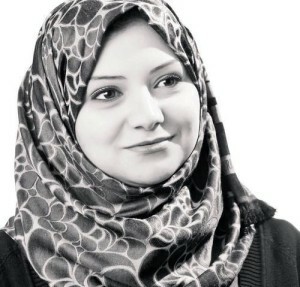 Gigi Ibrahim, born December 2nd, 1986 is an Egyptian journalist, blogger, and social activist. She graduated from the American University in Cairo where she earned a political science degree. Prior to college, Gigi had no direct links to the opposition movements that had been occurring in Egypt. Her involvement started with a lecture on “Social Mobilization under Authoritarian Regimes,” where guest speaker (later to be her husband) Hossam el-Hamalawy provided her with insight on activism in Egypt. As a result of joining the movement, Gigi has been credited as being a part of a new generation of citizen journalists who document news events using social media. She was featured on the cover of Time Magazine as one of the leaders of Tahrir Square during the Egyptian Revolution. Ibrahim states however that while the internet was important for coordinating people in the ousting of President Mubarak, “it was the battles on the streets that were crucial…” Besides being featured in Time Magazine, Gigi appeared in Frontline, BBC, Al-Jazeera, and on the Daily Show with Jon Stewart. Born in 1942, Elbaradei studied law at the University of Cairo. He began his career in the Egyptian Ministry of Foreign Affairs in 1964. He holds a doctorate in international law from NYU’s law school. In 1980, he became a senior fellow in charge of the International Law Program at the UN’s Institute for Training and Research. Elbaradei then joined the International Atomic Energy Agency (IAEA) in 1984 and worked his way to director general 13 years later. As a Nobel Peace laureate and former head of the UN’s nuclear watchdog, Elbaradei’s diplomatic career and experience led him to play a major role in Egypt’s post-Mubarak era. He was set to stand as a liberal, secular candidate in July’s presidential elections, but withdrew his bid in January citing concerns about the undemocratic way the military was governing Egypt. Elbaradei believed that a new constitution needed to be drawn up from scratch before any elections took place. In April, he took to Twitter calling the transition to democracy “bungled” and criticized the Supreme Council of the Armed Forces (SCAF) and their approach to writing a new constitution. Although he has withdrawn from the race, Elbaradei remains a central figure in this post-Revolution time period. Wael Ghonim, born December 23, 1980 is an internet activist and computer engineer with an interest in social entrepreneurship. He earned his BS in computer engineering from Cairo University in 2004 and a MBA in marketing and finance from the American University in Cairo in 2007. Wael joined Google Middle East and North Africa as their Regional Marketing Manager in 2008. In 2010, he became Head of Marketing of Google Middle East and North Africa based at Google’s UAE office in Dubai. During the Egyptian Revolution of 2011, Wael took leave from Google to focus on his work in Egypt and the Middle East. Around this time Ghonim founded a Facebook page titled, “We are All Khaled Said,” supporting Khaled Said who was a young Egyptian that was tortured to death by police in Alexandria, Egypt. Ghonim used this page to move and integrate the ant-government protests of the January 25th revolution. He first made an announcement on the page on January 14th asking members if they were going to plan on taking the streets on the 25th and model what Tunisia did. He later published an event entitled: January 25: Revolution against Torture, Corruption, Unemployment, and Injustice. He anonymously collaborated with activists on the ground to announce the locations for the protest. In January 2011, Ghonim persuaded Google to allow him to return to Egypt. He somehow disappeared on January 27th during the nationwide unrest in Egypt. On February 5th, 2011, Ghonim was reported to be alive and detained by the authorities. He was released after an 11 day detention. That same day, he appeared on an Egyptian Channel where in the interview he called an end to the Mubarak regime. By putting Egypt above all, Ghonim became one of the most influential people in 2011 Egyptian Revolution. Ramy Essam was born in 1987 in the small city of Mansoura, Egypt. He is a musician who taught himself how to play the guitar and started writing songs at the age of 17. Essam was inspired by young poets like Ahmed Fouad Negm who spoke up against Mubarak’s regime. He eventually established the band “Mashakel” (which means “Problems” in Arabic) in 2009 and through this band, he illustrated the simple daily problems all Egyptians lived with under Mubarak’s regime. 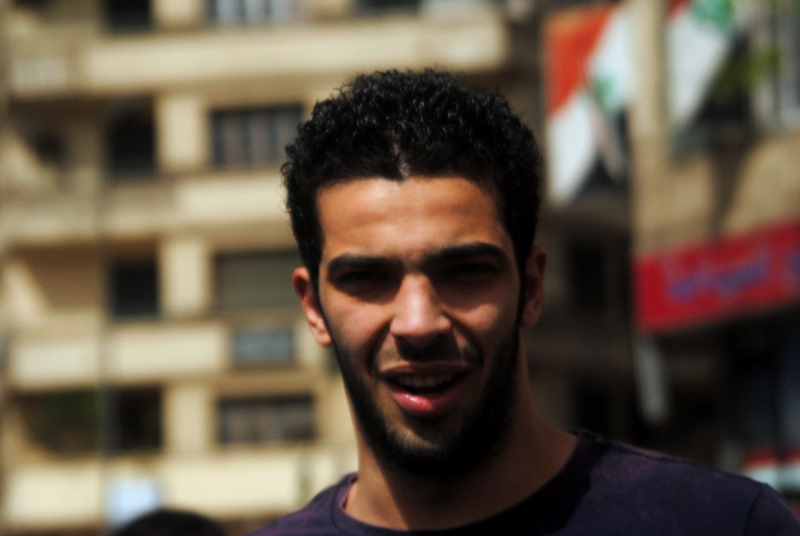 Ramy Essam is best known for his appearances in Tahrir Square in Cairo during the 2011 Egyptian Revolution. His song, Ihral, in which Mubarak is urged to resign, gained great popularity among the demonstrators. It became internationally known through YouTube and is referred to as the anthem of the Revolution. However, when Ramy returned to Tahrir Square after Mubarak finally stepped down, he was identified as an agitator and arrested for hours and beaten. That didn’t stop Essam from pressing on and fighting for what he believes in. He went on to later perform multiple songs in different places across Egypt as well as in different countries such as England, South Africa, Sweden, and Germany. Essam is a literal example of someone who became the voice of the Egyptian Revolution. Mahmoud Salem, better known as “Sandmonkey”, was born on May 21st, 1981. He is the ounder of the popular Egyptian blog: “Rantings of Sandmonkey”. After attending college in the United States, Salem returned to Egypt with the ambition to change his country for the better. He describes himself as an “extremely cynical, snarky, pro-US, secular, and libertarian. He writes his commentary on everything from Egyptian and American politics, to women in Egypt, to terrorist attacks, and so on. He also features stories about other bloggers and their arrests by the Egyptian Police. He has recently proposed the creation of an organization that focuses on the “causes of bloggers and freedom of speech in the Middle East”. The goal of this project is to publicize the bloggers’ cause and push for their protection against their oppressive governments. During the January 25th revolution, Salem took the streets to express his contempt towards the corrupt regime. Like many other bloggers, Salem was attacked by police officers dressed in plain clothes during the protests. Though Salem was able to keep his identity hidden for years, he decided to reveal his real name in February 2011 after the fall of the Mubarak regime.